Create a project based on my blog “UPDATED Setting up a JEE 6 Web Profile Maven Project in Eclipse using TomEE”. 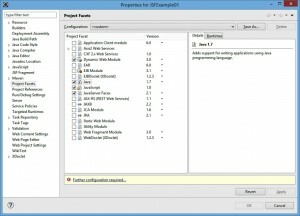 Eclipse reveals its special capabilities such as specialized editors based on the project’s facet. 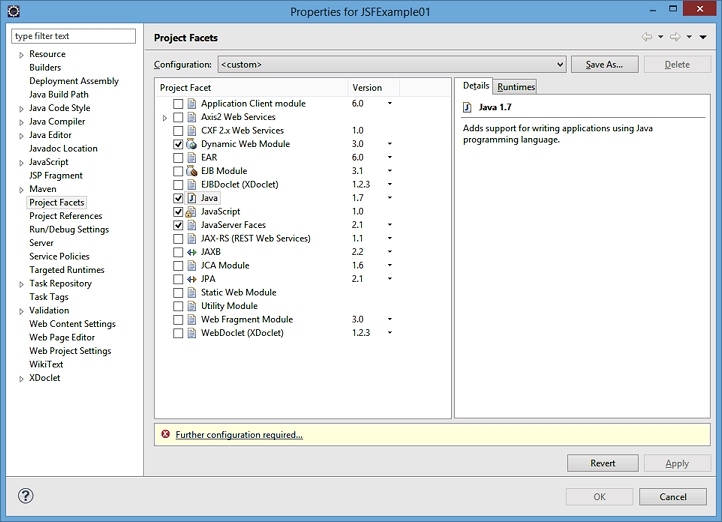 As it now stands the project you just created will allow you to create Servlet/JSP applications. 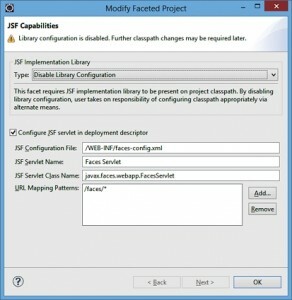 You need to add the JavaServer Faces facet to the project. 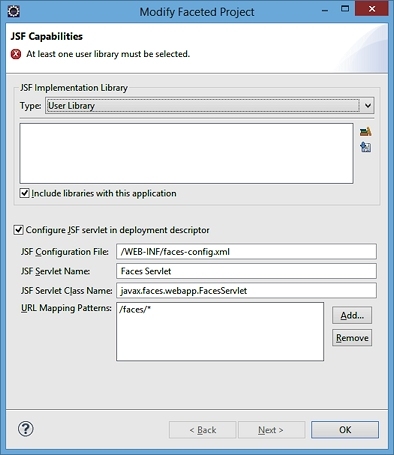 The version of TomEE, 1.6.0, that I am using does not yet have JSF 2.2 in its library. Its current version is 2.1. If you need to use 2.2 then there is a beta version of the library available as of this writing. Do not click on OK yet. Pull down the combo box at the top labeled “Type:” and select Disable Library Configuration to replace User Library. This is necessary because the JSF libraries are already in the lib folder of TomEE and Maven knows what libraries are required. 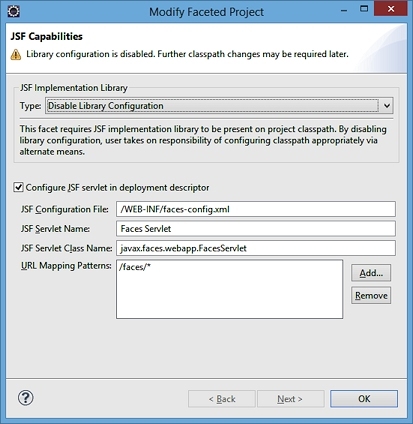 While it is possible to create a JSF application without the JSF servlet deployment descriptor the Eclipse tools use it in some instances. The checkbox must be checked and the values that show in the textboxes can be left as they appear. Simply put, you need to replace the 2_5 with 3_0 and the 2.5 with 3_0. Save files and do another Maven->Update Project and the errors all disappear. Searching for this revealed two solutions. One was to go into Windows -> Preferences -> Java -> Debug and un-select “Suspend execution on uncaught exceptions”. I did this and it made no difference. The second solution was to right mouse click on the two Unknown descriptions, right mouse click and delete. You are warned that they may come back but in my case after a Maven -> Update Project and a Run -> Maven Build the markers did not return. You are now ready to create a JavaServer Faces application. Projects created this way will open and execute successfully in NetBeans when the project is saved to a Subversion repository.